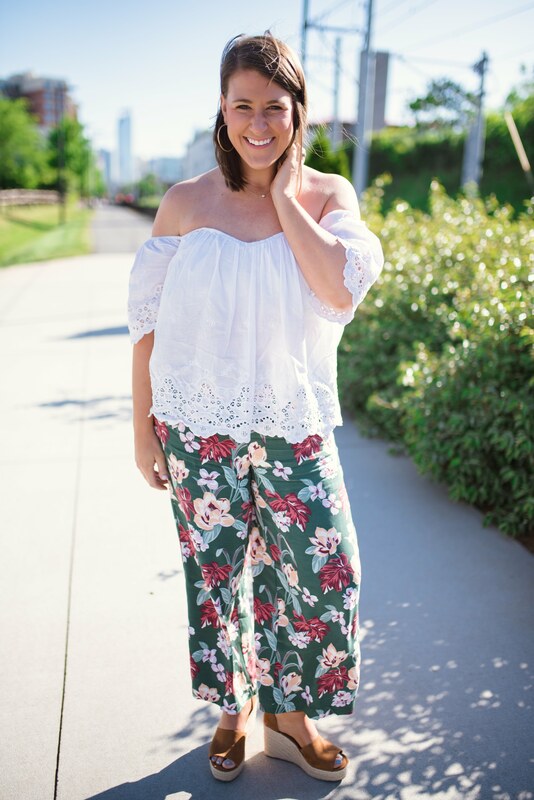 When I saw these pants on the Loft website, I knew I had to have them! The material is even better in person and they are so relaxed and comfortable. I love the floral print so much! These run a little big, so I would suggest sizing down. This is one of my favorite OTS tops that I have had for a few years now, but I love the eyelet detail with these pants. I also LOVE these paired with black. I wore this to a work meeting and got so many compliments. The front tuck gives the look a little more structure and the shoes dress it up. I try not to say this too often, but these pants might be my favorite for Spring. I just love the way they fit and they are so comfortable and will not make you hot as these temperature keep on rising. They are on sale right now for $36! I hope y’all have the best week! I’m already counting down for Memorial Day Weekend! I’m going to see my parents at our lake house in Alabama and I cannot wait!